Cute product packaging usually uses pink as background color and can also be applied to printed tube box packaging. Because the overall color is pink, the use of pink paper as face paper, printing directly on pink paper, will save printing costs. The same product, although using the same package design, but due to the different models, should be reflected in the printed content in order to quickly distinguish between sales, no errors. Since this is a sweet sauce package, “SWEET SAUCE” and “3” are printed directly on the front, with the main purpose of highlighting the product; the bottom is a short supplementary slogan to make it easy for consumers to remember and to have preliminary To understanding. 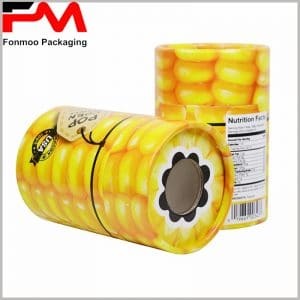 But as the food packaging, these are far from enough, must reflect the composition and characteristic of the food on the surface of the cylinder packaging, this is the key that the consumer understands the product deeply, and make the buying decision. The advantage of pink paper as a tissue paper is that it can hardly be creased at the junction of the tissue paper, which is in line with the standard of high-quality product packaging. Because this is a small box, the diameter of the package is only 5cm, and the weight is lighter. Therefore, 300g of cardboard is used as the main raw material.